Needless to say, my shooting partner was astounded when a big dog coyote bounced out of a shallow draw 20 yards in front of us and locked up like it had run into a glass wall, while I was still squealing and squalling my first series of rabbit distress sounds. It never ceases to amaze me when a coyote seemingly appears out of nowhere, within less than a minute of my starting to call, and ends up glaring from a few yards away. I figured this coyote stood an excellent chance of running away unscathed as my companion was on his first predator calling venture, and such an unexpectedly instant response was probably not what he’d expected. All of this flashed through my mind in micro seconds as I watched the coyote survey the situation, realize the free lunch sounds were bogus, and start to whirl away in a blur of motion. I certainly wasn’t expecting the equally speedy, sharp crack of my companion’s Ruger .204 nor the almost instant demise of the coyote. I was impressed by the clean kill on a thickly furred, hefty mountain coyote, and even more impressed when I examined the carcass and could barely locate a small bullet entrance hole to the rear of the rib cage and no exit hole at all. Later, after I’d pelted the prime coyote, I opened up the carcass and saw why the animal had expired almost instantly. The diaphragm and both lungs were shredded and jellied; the heart showed considerable hydrostatic shock damage. Bullet performance doesn’t get any better than that, not for a pelt-saving predator caller. To my way of thinking, the perfect all-round predator cartridge would take a red fox, bobcat or other lightweight carnivore at point-blank calling range, leaving a caliber-sized entrance hole and no exit hole, expending the total foot pounds of bullet energy within the animal for a quick kill and zero pelt damage. The perfect cartridge should be capable of consistent groups under 1 inch at 100 yards, throwing a bullet with a high ballistic coefficient to allow for wind bucking and a flat trajectory out to 500 yards with as little bullet drop as possible. My dream would also maintain enough down-range energy and speed to flatten the largest coyote at that range, with the same devastating bullet performance it had at close range, again with zero pelt damage. The gun and ammo companies are working on it, but perfection will probably always be a dream. Might as well wish for PETA to drop their anti-hunting campaign and instead promote common sense predator management. The .204 Ruger, .223 Winchester Short Magnum, .17 Remington Fireball, .17 HMR, and .17 Hornady Mach II are all relatively new and have been promoted to the public as THE cartridge for varmints or predator hunting. All are high-tech marvels, and all come up short in one area or another. Just a few months prior to the opening episode in which the .204 Ruger performed perfectly on a called and conned coyote, myself and several other writers were on a Wyoming prairie dog hunt sponsored by Hornady to test the new .204 and also Hornady’s hot little .17 Mach II rimfire on a burgeoning population of prairie rats. I was immediately impressed by the inherent accuracy off the bench of both of these new but very different rounds, and I was still impressed after seeing them perform in Wyoming’s notorious winds. I shot several almost one-hole groups at 50 yards with the neat little bottlenecked .17 Mach II rimfire, pushing a polymer tipped 17-grain bullet at 2,100 feet a second. This little rimfire is just a bit lower on the velocity scale than its predecessor, the .17 HMR, which pushes the same 17-grain slug at 2,500 fps. So why two very similar .17 rimfire rounds from Hornady? The real selling point and motivation behind development of the .17 Mach II is the fact that it will work in the actions and magazines of rifles previously designed, chambered and manufactured for the .22 long rifle cartridge. The .17 HMR is based on the longer .22 WMR case. Mach II rounds feed through clip-fed or tubular .22 magazines with little if any reworking. I’ve shot several Ruger 10/22s rechambered for the .17 Mach II (the bolt and springs have to be beefed up a bit to handle the heavier recoil) and I have a superbly accurate Thompson Center Arms R55 Benchmark in .17 Mach II that is a tack-driving delight. I’ve also used the .17 Mach II extensively on cottontails and squirrels, and when the bullet is properly placed in the head or front shoulder, kills are clean with relatively little meat damage. This past winter, I made a number of quick, one-shot kills on jackrabbits out to 100 yards, which was a pleasant surprise considering the toughness and tenacity of those winter-furred jacks. However, in my estimation, and as a result of bullet testing in ballistic gelatin, neither the .17 Mach II nor the more powerful .17 HMR are in the running as serious predator cartridges. The range and bullet size of both is just too limiting. The first of the new varmint cartridges to hit the market a few years back was the .223 WSM. It was touted as a high-speed predator/varmint cartridge to complement the line of WSM big-game cartridges. This type of short, fat case has been the rage of benchrest shooters for many years, but I don’t think the .223 WSM does anything the venerable .220 Swift and the even more popular .22-250 won’t do as well and with less fuss. The factory loading of either a 55- or 64-grain bullet at slightly over 3,800 ft/s muzzle velocity is very similar to the other two speedy .22 cartridges. 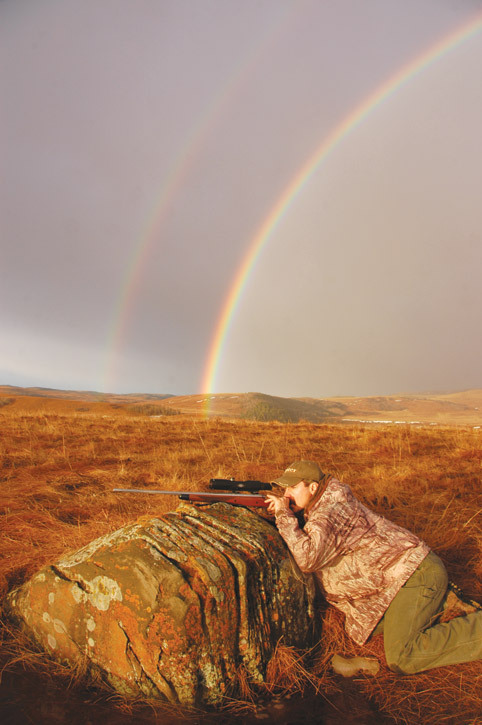 Accuracy and downrange performance of the .223 WSM are on par with the .220 and .22-250—as is the potential for pelt damage when a smaller animal is hit at close range. This is a drawback shared by all high-speed .22 centerfires, unless they are hand-loaded specifically for that type of hunting shot. In my opinion, the .223 WSM didn’t offer anything that wasn’t already on the market and time proven. That being said, I must also add that it’s an excellent cartridge (same as the .220 and .22-250) with a wide variety of bullets and reloading potential. If you’re a Winchester fan, you won’t go wrong with a .223 WSM. The .204 Ruger is essentially a .223 Remington magnum necked down to 20 caliber with a factory loaded 32-grain bullet leaving the muzzle at an impressive 4,200 ft/s. The growing popularity of this flat-shooting, inherently accurate cartridge has gained the attention of most of the major gun companies, who now chamber rifles for it. It didn’t take long for manufacturers of the exceedingly popular, redesigned and accurized semiauto AR-15s, such as Bushmaster and Rock River Arms, to jump on the bandwagon and offer rifles in .204 Ruger, which is slightly faster and shoots a tad flatter than the proven 5.56mm NATO or .223 Remington. Twenty-caliber bullets are available to handloaders in weights from 30 grains to 50 grains. The most popular and efficient bullet weight is between 35-40 grains, where a handloader can get the best combination of accuracy and velocity. Lightweight, fast, frangible bullets make the .204 ideal for the close-up shooting that is the stock-in-trade of most predator callers. Even at point-blank range, the .20 bullet generally makes a small entrance hole and no exit wound, expending all of its energy within the predator. This is ideal for minimal pelt damage. ’Course, there is always going to be the exception when you hit a thin-skinned critter like a red fox at point blank range and in the wrong place, but that’s where needle and thread still come in handy. The .204’s factory loaded 32-grain bullet has a super flat trajectory and packs enough punch to make a clean kill on a coyote out to 300 yards. If most of your predator encounters are under 200 yards, it should work fine. But if you want to extend the downrange punch, I’d opt for a bit more bullet in the 40-45 grain range. The rapid leap in popularity of the .204 Ruger probably had a lot to do with Remington bringing out their .17 Remington Fireball this January. When I first shot the .17 Fireball on the range at a gun show, and again later off my home bench rest, I was suitably impressed with the little cartridge’s mild recoil and accuracy. Almost all the five-shot groups at 100 yards with factory ammunition were under 1 inch, with several holding between 1/2- and 3/4-inch. My first kills were Colorado prairie dogs, and as expected, the 20-grain bullet blitzing along at 4,000 ft/s disintegrated itself and the rodent on impact. I still had doubts about just how effective the minuscule 20-grain Accupoint bullet would be on a coyote, and I was suitably impressed on a subsequent trip to Canada (discussed in the June issue Game Calling column) where the .17 Fireball made instant kills on hefty prairie coyotes out to 200 yards—with almost invisible entrance holes and no exit holes on broadside hits. Another hunter on that trip reported one angling front shot entering through the throat and exiting behind the shoulder, dropping the coyote in its tracks and leaving a small, easily repaired exit hole in the pelt. The .17 Remington Fireball definitely has a place in my predator hunting arsenal. (That is, if I can get it back from my 14-year-old granddaughter, who has laid permanent claim to it.) I also plan on getting a .204 Ruger barrel for my Bushmaster AR-15. Where I figure most of my shots will be at fox, cats and the occasional coyote at under 200 yards, I’ll be toting the easy handling, lightweight Remington 700 bolt-action in .17 Fireball. Where the ranges are likely to extend to 300 yards and involve the chance of fast-action shooting, I’ll pack the semiauto Bushmaster with .204 barrel. All the same, I don’t plan on getting rid of either my .220 Swift or my .22-250 anytime soon. I’m glad I don’t have to make a choice as to which rifle and cartridge would be my one and only. The perfect cartridge for all varmints and all situations may be only a dream. But the freedom to pick and choose between several outstanding ones is a reality.